This entry was posted in NASA and tagged Cape Canaveral, GOES, Kennedy Space Center, Rockets, Saturn V, science, Space program, technology on March 15, 2018 by Jim R.
Early in 2018, our son-in-law invited us to be his guests at a launch at the Kennedy Space Center in Florida. We immediately said “yes.” Our SIL is literally a rocket scientist/engineer. He works for a company contracted by NOAA and NASA, whose mission is to support the launch and instrument checkout of the next generation weather satellites of the GOES-R series. 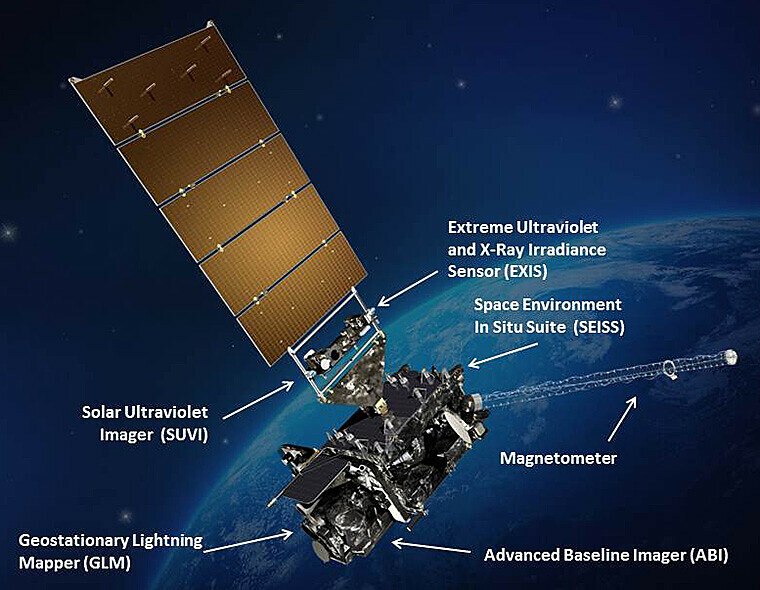 Geostationary GOES-R was launched 19 November 2016 and is now part of the National Weather Service fleet. It views the eastern half of the U.S. and the Atlantic Ocean. Storm development, lightning, and hurricane tracking are parts of its main focus. Our invitation was to watch the launch of GOES-S on 1 March 2018. When GOES-S is commissioned several months after launch, it will view the western half of the U.S. and the Pacific Ocean as GOES-West. Pacific storms, their impact on the western states, and forest fire tracking will be parts of its main focus. 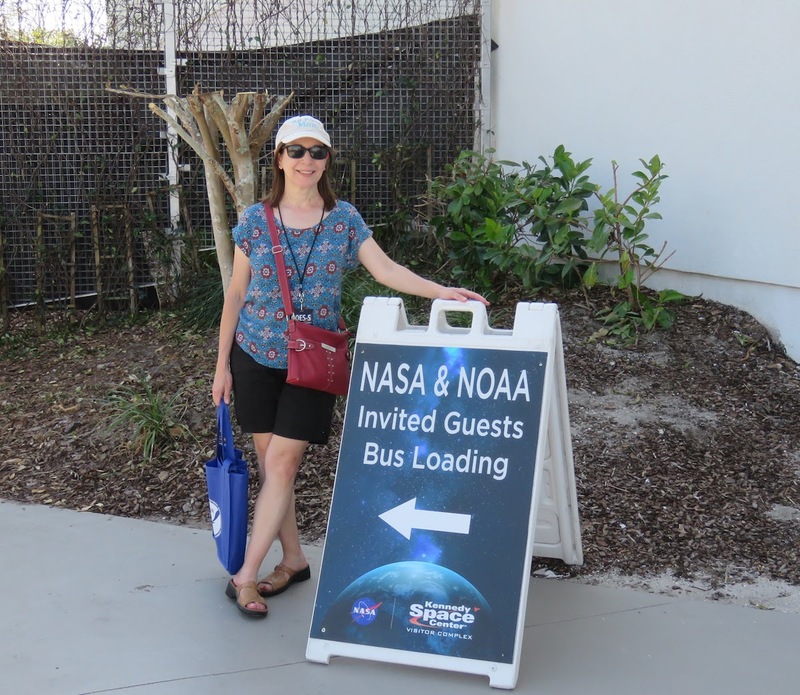 This post is about the Kennedy Space Center Visitor Complex. 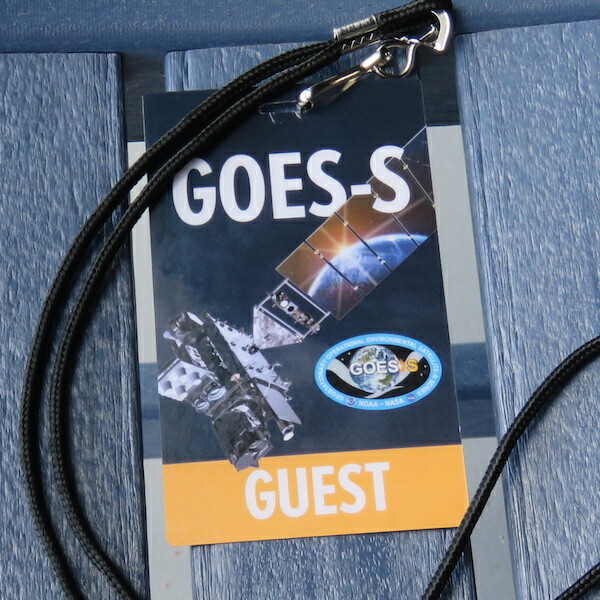 Our next post is about viewing the GOES-S launch later that same day. 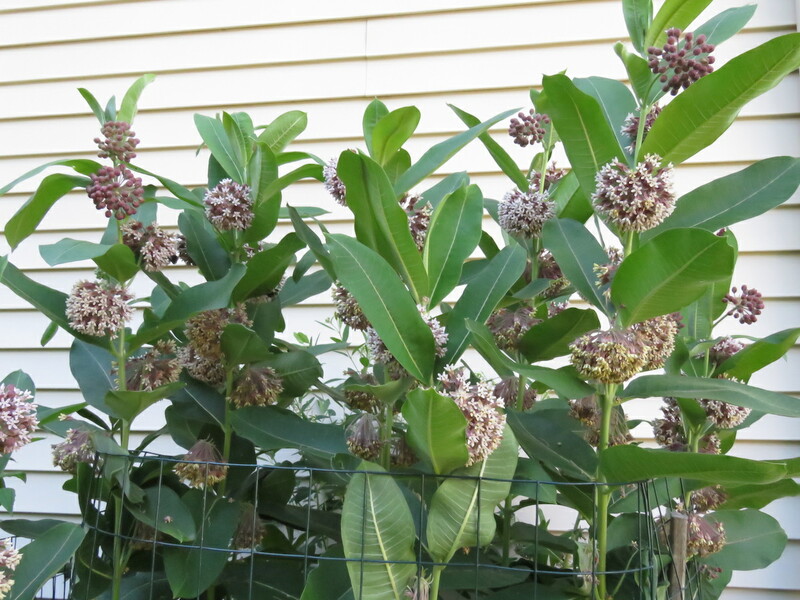 This entry was posted in NASA and tagged Astronauts, Cape Canaveral, Kennedy Space Center, Rockets, Saturn V, science, Space program, Space Shuttle Atlantis, technology on March 11, 2018 by Jim R.
This entry was posted in Backyard and tagged Milkweed, Monarch, Nature, science on June 28, 2017 by Jim R.
The early morning sunlight shined through grape leaves near our path. 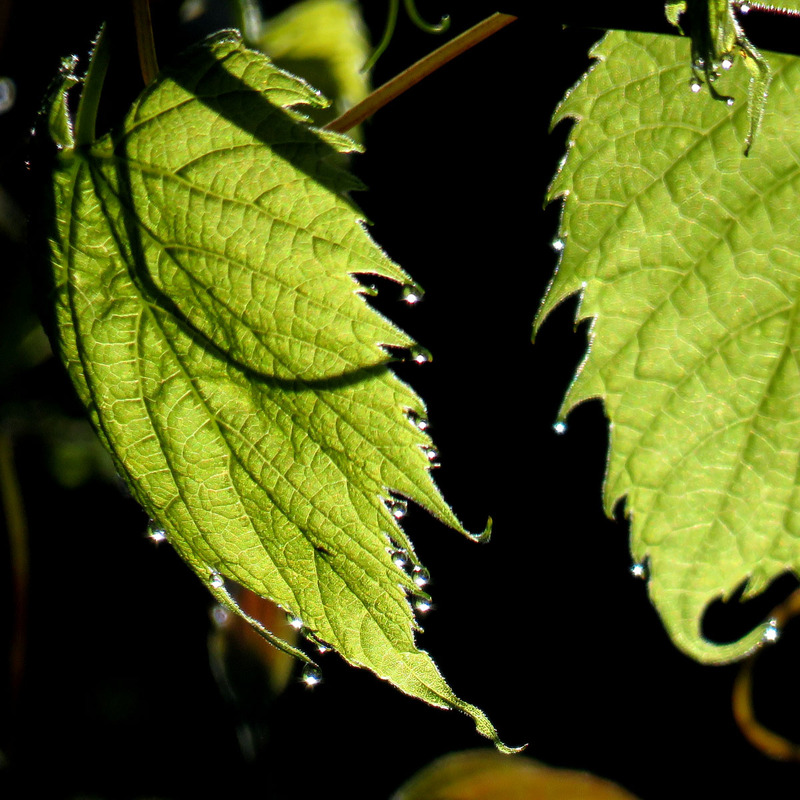 Tiny drops of dew still clung to the points on the edge of the leaves. Each one sparkled brightly with a miniature sun inside. 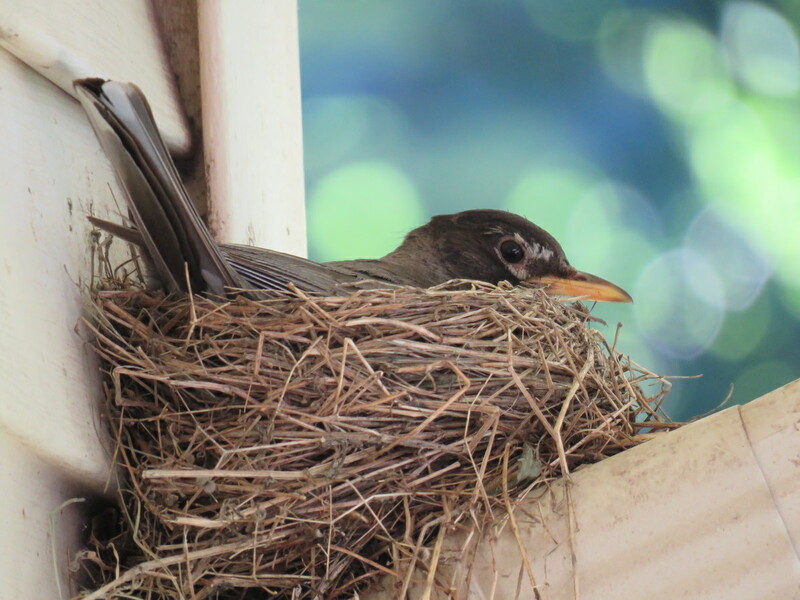 This entry was posted in Backyard and tagged Light, Nature, Photography, science, Sunshine on May 26, 2017 by Jim R.
On 17 Nov 2016 we reached a near-record high of 75˚F in eastern Iowa. It started to cool off the next day and got very windy. That night and the next day were much colder and windy with gusts in excess of 45 mph. Most of the trees already dropped their leaves before this recent weather. The strong wind removed the rest, except for the mulberry trees. 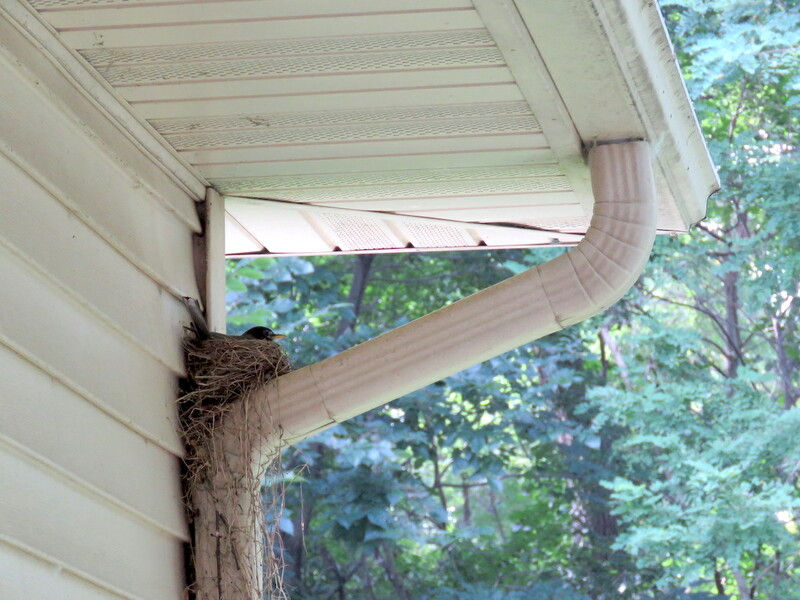 They still held tight to their dried leaves. The next morning, it was the coldest night of the year at 20˚F. We knew what to expect from the mulberry trees. As the temperature warmed to near freezing, they would drop their remaining leaves within an hour. The process involves something called abscission. 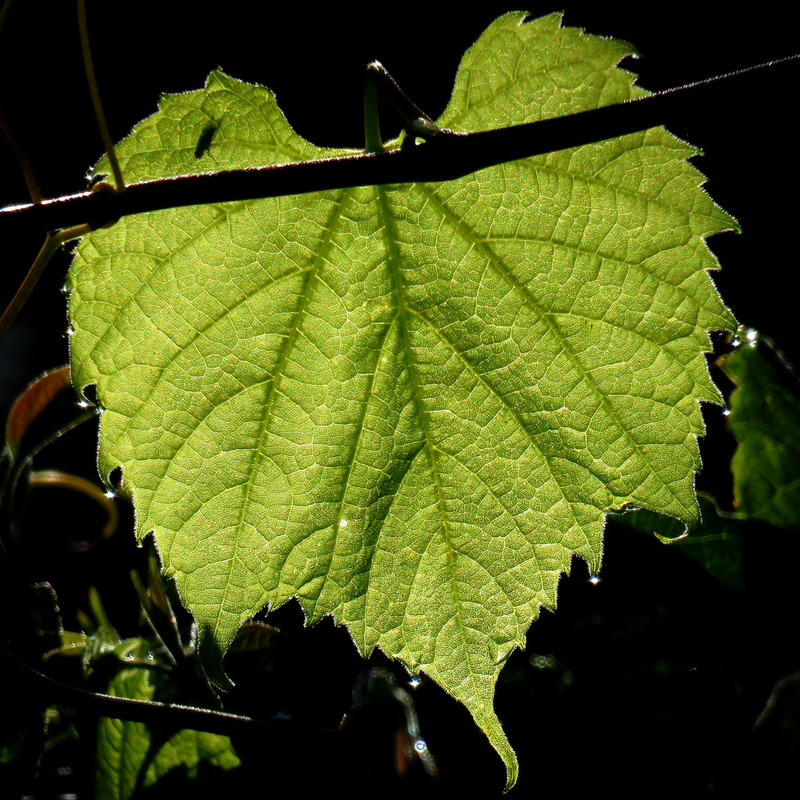 Earlier colder and frosty nights triggered the formation of a thin layer of cells at the base of the leaf stem. The very cold temperature helped complete the process of cutting the leaf loose from the stem so it could fall. 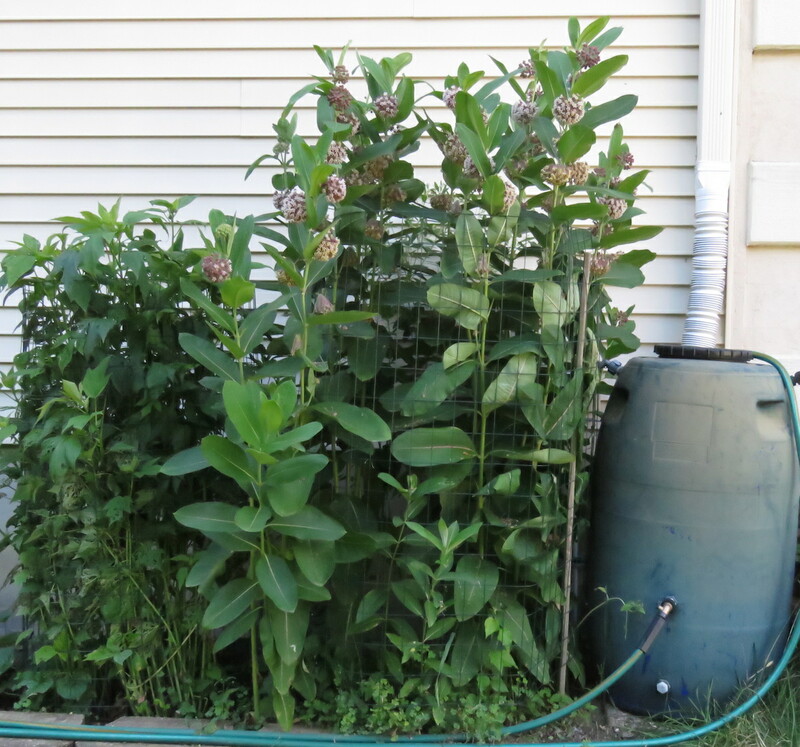 In this video the leaf drop occurs on the tree behind out neighbor as the sun warmed the leaves. There was no wind. The video is speeded up by 4X. It will help to view on a larger screen. This entry was posted in Backyard and tagged Abscission, Leaves, Nature, science on November 21, 2016 by Jim R.
From several feet away it looked like a bit of leaf stuck to the window. I got closer and noticed legs and a head. It was only 2 inches long. I hurried for the camera and got these two views looking through the glass to the outside. The purple barberry bush gave a dark background for contrast. 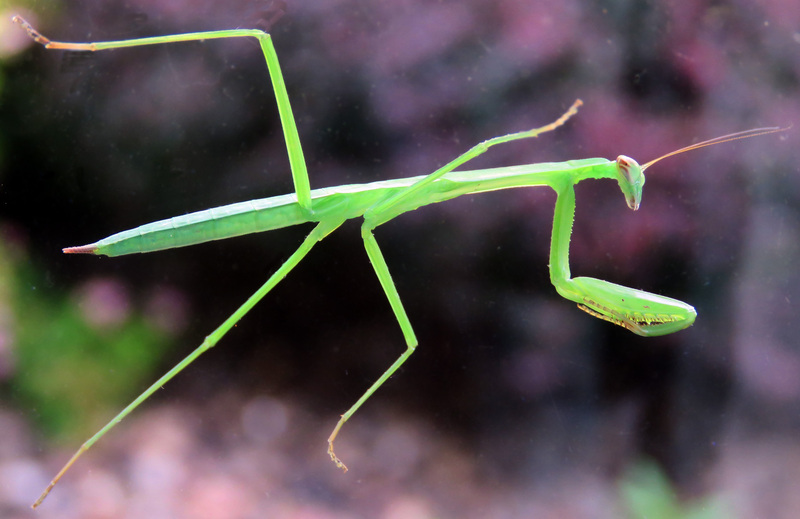 This entry was posted in Backyard and tagged Insect, Nature, Photography, science on July 7, 2016 by Jim R.
It was always a treat for a kid to find a toy in a box of cereal. This prize was offered in the 1980s by Kellogg’s in their Frosted Flakes cereal. At that time we lived in the western suburbs of Chicago. I was active in a physics teacher group that met monthly in order to share teaching ideas and demonstrations. There were two other groups for the northwest and the southwest suburban areas, as well as a group active in Chicago itself. Once a year all of the groups met at a central college campus for an evening of sharing and give-aways. Melanie suggested that I should write to Kellogg’s and request some Diving Tony toys to give away to the teachers at the next meeting. That I did. Kellogg’s sent me a free boxful of perhaps 100 of the toy. Needless to say, Tony was a big hit with the physics teachers. Everyone got to take Diving Tony the Tiger home to show their students. Recently, we were watching NCIS, one of Melanie’s favorite shows. There was a scene in which a small diving toy-like device was used to show how some criminals accessed their underwater drug stash. We both looked at each other, laughed, and said ‘Diving Tony!’ That prompted me to write to Kellogg’s again. In the mid-80s, I wrote to Kellogg’s and requested a large number of Diving Tony the Tiger toys to give away to my fellow physics teachers at a large meeting. The company graciously obliged and sent me a box of them. There might have been 100 in that box. Do you have some background information about that promotion that I can read? History, popularity, how many the company gave away in cereal boxes, etc. I am not able to find much on your site or anywhere else. Thank you for taking the time to contact us. To better assist you with this, we ask if at all possible. If you could can send or email us an image of the item that was provided (tony the tiger toys) ? Thanks again, Jim, for contacting us. This video should be helpful. It was posted by Doug McCoy on YouTube. We appreciate you following up with the link to the YouTube video showing the diving Tony premium offered in 1987. While details are limited on this item, I was able to find out that this was an extremely popular item that we offered in the 1980s. Over 27 million were packaged in boxes of Frosted Flakes in 1987 between October and December. Additionally, there was a “Tony’s Treasure Hunt” on the side of the box that could be placed behind a water source and used as a game. With 4 different depths, it was your objective to be able to get Tony to each depth and back to the surface. Please know that your comments regarding our past premiums are valued and will be shared with the team. Thank you again, Jim, for contacting us. We wish you all the best. I found this comment posted 2 years ago on the YouTube channel below the video. I had a friend who dove Tony in a bottle then capped and sealed it with tape. He hid that sealed bottle in a closet for years. I told this story to another one of my friends & his eyes lit up, regaling me with his love for that lost toy. we rescued Diver Tony from the closest & took that thing everywhere. I once visited a rest stop on I-23 near Battle Creek, MI where Kellogs were having a demo. Met Tony the Tiger and showed him my Diver Tony. He did a little dance and took a picture with me. This entry was posted in Personal and tagged Challenge, Game, Humor, Physics, science, Toy on February 16, 2016 by Jim R.